It’s a Wednesday Night and you are in the Mission. You are at 18th and Bryant to be exact. You find yourself attracted to the colorful murals flanking the outside walls as the music of Piazolla, Bajofondo or Tom Waits drifts out on to the street. As you enter, an ever changing art gallery greets you and as you continue inside, you find a cavernous space with a medley of dancers all moving together under an array of colorful lights. You have found Cellspace. 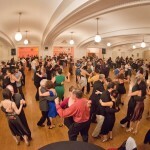 Cellspace is THE “Alternative Milonga” in San Francisco. 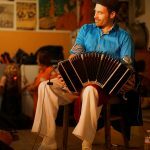 Presently, it’s the only Tango venue in San Francisco that is dedicated to playing alternative tango music. For this very reason, people either avoid it or love it. 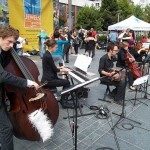 Either way, Tango at Cellspace draws a large crowd. 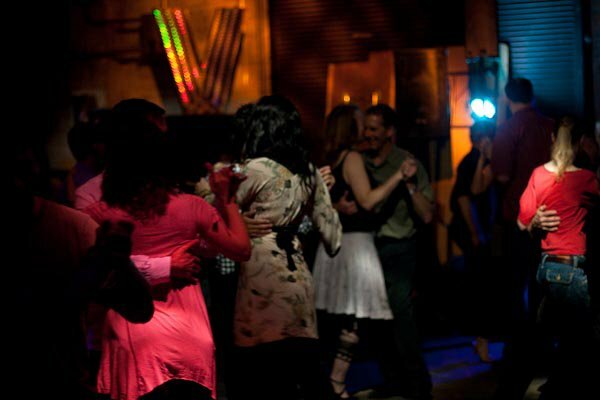 Some people come because they enjoy nuevo tango or have danced other dances and enjoy fusion Tango. 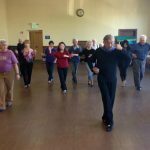 Some are new dancers that are drawn to its relaxed atmosphere and affordable classes with excellent teachers. Still others appreciate its relaxed “codes” and the opportunity to free up their dance. Sometimes people come just for the live music and guest performances. My personal favorite are the themed nights, when people come in costumes and arrive in a mood for fun. Whatever the reason, Cell Space is one of the few venues that has maintained its popularity over the years. 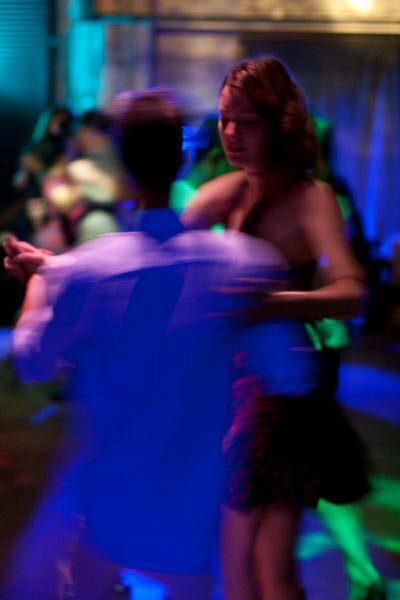 Dancing Tango at the Cell, one can dress up or down or anyway you want plus it’s the only place that experimentation is not only allowed, it’s appreciated. This not only goes for the dancing, but also applies to the music. The DJ’s rotate weekly, and although the format is 50% traditional (Golden Era) and 50% alternative, the music selection is guaranteed to be unique. Two DJ’s share the night and between the two of them the music can vary greatly, which is often part of the fun and the challenge. And although you are free to dance as much nuevo tango that you want, maintaining the line of dance and watching out for others is highly recommended. 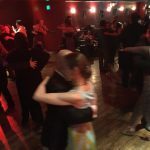 Cellspace Tango came to fruition on the 9th of July 2003, (which also happens to be Argentina’s Independence Day) and stemmed from a need for a true alternative Tango dance venue in San Francisco. 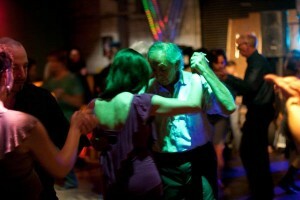 The founders were three people in the Tango community who put on the whole event themselves for the first year. By the second year, Project Tango was formed, a non-profit organization who’s mission is “To promote tango as a social dance and evolving art form in our world culture while building and maintaining individual and community integrity, balance and respect.” Today the event is run solely by volunteers who do everything from bringing snacks, to teaching the classes, DJ’ing, watching the door and closing up after the night is over. 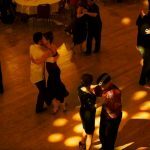 Speaking with one of the primary founders of Cellspace Tango, Homer Ladas, I asked him his thoughts on the future of Cellspace. He said he would like to see more theme nights, a community orchestra to produce music for dancing and possibly more workshops similar to SFTX. Lucky for us, the future of Cellspace is looking very bright! 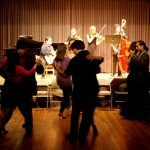 This is a “politically neutral” tango event with all attempts directed towards minimal interruptions and maximum dance time during the evening. A flyer table is provided for all folks to advertise their classes and events, however, detailed verbal announcements will not be made. After a performance, a brief verbal announcement is permitted to promote a relevant class or event pertaining to the performers. All the folks who help out with this event are donating their time and talent. We are always looking for new volunteers to help in set-up, break-down, food, water, house management, DJ-ing, etc. 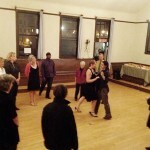 Volunteers get free admission to the Cellspace alternative Milonga. 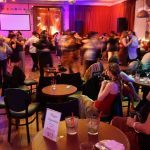 If you are interested in volunteering or performing at CELLspace, please visit the Project Tango Web site. You can also visit the Project Tango Facebook Page. This coming Wednesday is Rainbow Night! Celebrating Homer and Cristina’s return to the Bay Area after their summer away. Come wearing any color of the rainbow (white is okay, just no black). Homer will be the DJ for the night and will be spinning the tunes from 9:10 – midnight.